(035.81) */1 MR 62 on block of four QE2 6d (SG.216) fragment. (T.2) B/NO 11 96 on block of four QV 3d (SG.15a). 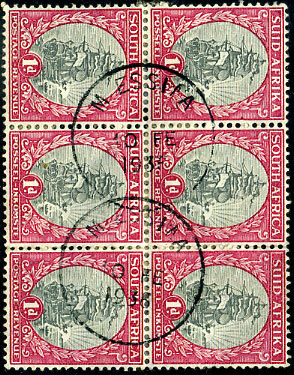 (OPD4) 2 OC 05 on block of ten ¼d Seal (SG.105), a rare attractive display multiple. 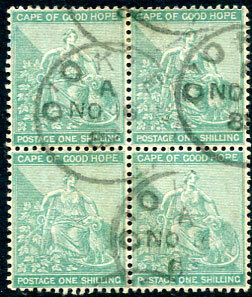 (CDS) A/NO 10 89 on block of four 1885 1/- green (SG.53). Cat.£34.00. (T.6A) NO 25 12 on horiz. 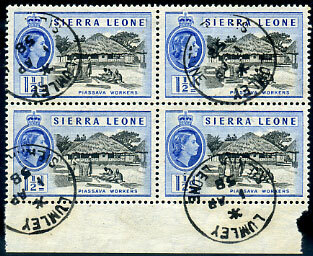 strip of three KE7 1d (SG.34) piece. (T.R15) AP 4 13/A on horiz. strip of three KE7 1d (SG.34) piece. (CDS) B/MY 2 94 on horiz. 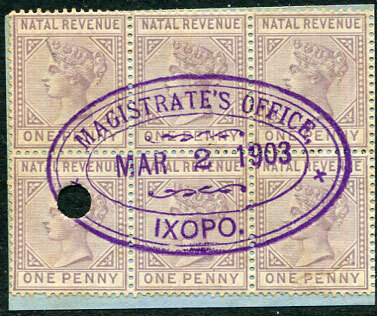 strip of three QV 1d Keyplate (SG.27). (T.R13B)A/8 SE 04 on vertical strip of three KE7 ½d (SG.21). 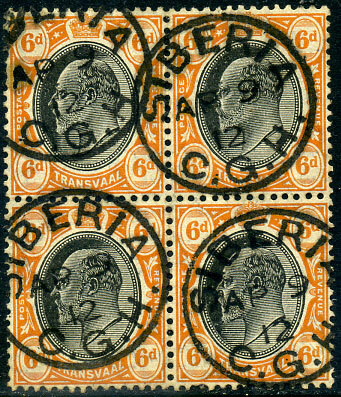 (087.01) */1 AP 58 on block of four QE2 1½d (SG.212). 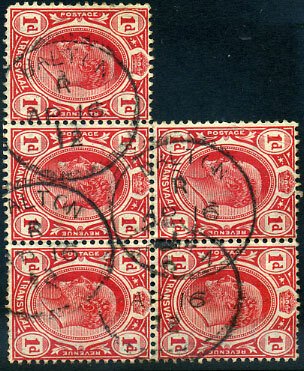 (M.2) A/DE 4 09 on block of four KE7 1d (SG.147) piece, top left stamp with tear. 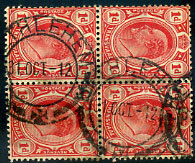 on block of four 1904 KE7 ½ pi (SG.62), perfs splitting. 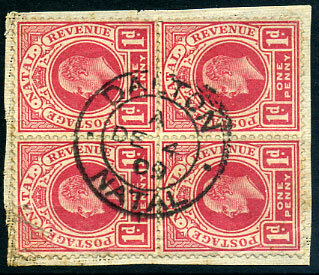 on an attractive used block of eight QV 1d rose-carmine (SG.28a, Cat.£51). A/JU 5 04 on horiz. 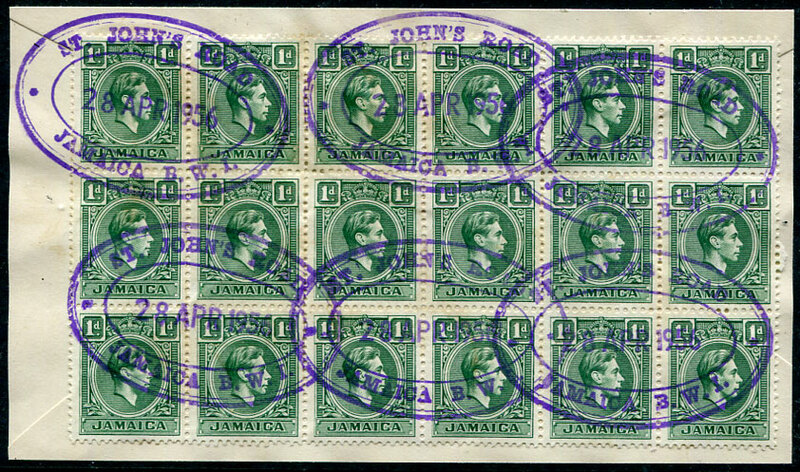 strip of four ¼d (SG.45). (D3) 31 MR 45 on block of four KG6 1½d (SG.152b). 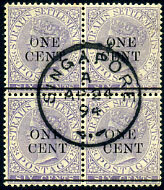 A/NO 15 09 on single, strip of four KE7 1d (SG.71) piece. B/20 NO 00 on horiz. 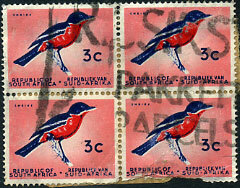 strip of three 1d (SG.59a). 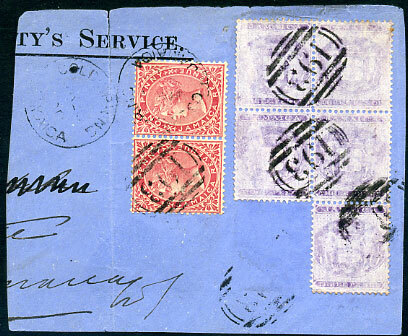 Postal Fiscal piece with pair QV 1d (SG.F3) and block of five 3d (SG.F6, further stamp removed) showing COLD SPRING MR 28 91 cds. 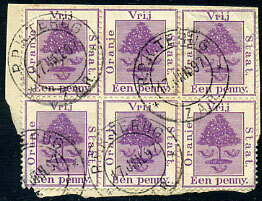 A/AP 24 94 on block of four QV "ONE CENT" on 6c lilac (SG.90, Cat.£38). on horizontal strip of three QV 3d Pine wmk (SG.3). (D2) 28 NOV 1911 on block of four ½d (SG.100). (056.01) */MY 14 27 on horiz. 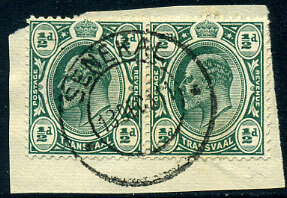 strip of three KGV ½d (SG.131). 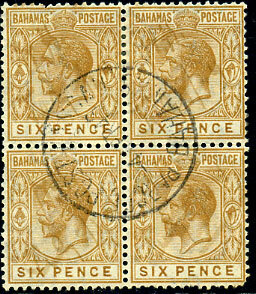 (124.01) C/DE 18 31 on block of six KGV 1d (SG.132a), some hinge re-inforced perf. splitting. 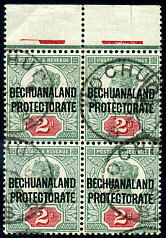 (R4) dated REG/OC 11 26 on block of twenty four (3 x8) 1914-22 1c grey MCA wmk (SG.261). 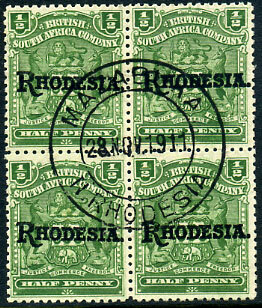 10 FE 1936 on block of six South Africa 1d. 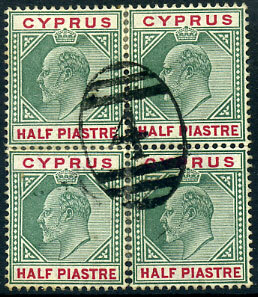 dated 10 3 1950 on horiz. 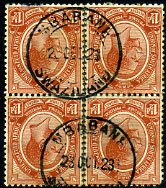 strip of three South Africa ½d. (099.01) */9 MY 17 on horiz. 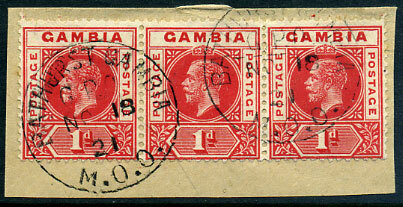 strip of four KGV 1d (SG.132), re-inforced split perfs. (107.04) */NO 4 31 on horiz. 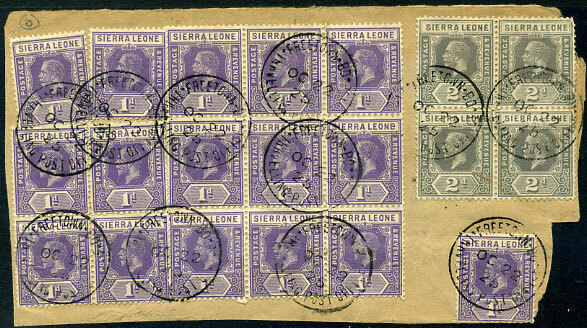 strip of three KGV 1d (SG.132), re-inforced split perfs. 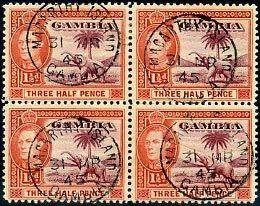 (PP2) 4 APR 46 on manuscript cleaned block of four KGV 6d Mult. Script CA wmk (SG.122), tiny faults. 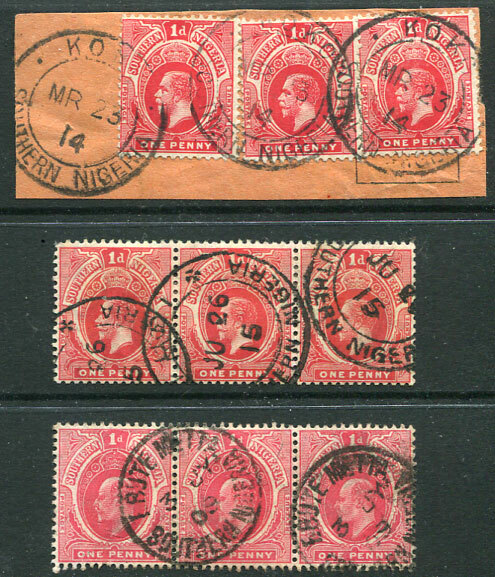 re-joined pair and two singles dated C/SP 18 90 on QV 1d carmine-rose (SG.24) showing positioning of duplex cds, some perf. defects. 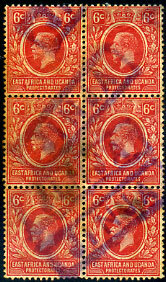 23 OCT 23 on two hinged together re-united vertical pairs South Africa KGV 1½d. 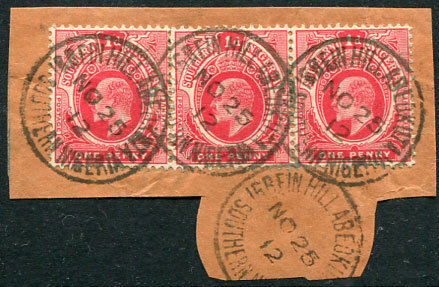 (202.02) */OC 22 25 on sixteen KGV 1d, block of 4 KGV 2d (SG.132,134) piece. 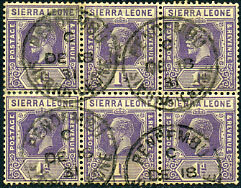 used UP TRAIN dated 17 JAN 97 on block of six 1d purple (SG.68) fragment, top right stamp with tears, creases, and corner fault. 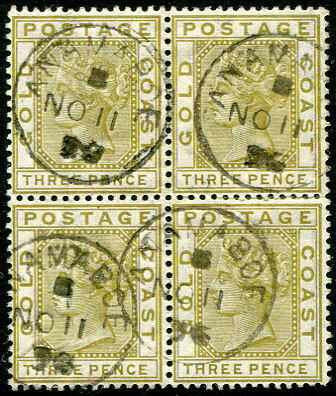 OC 26 02 on cancelled-to-order top marginal block of four GB ovp'd QV 2d (SG.62), full gum on reverse. (TRD) large part PARCELS handstamp, some faults.